When the Luxton Town and District Bus company finds itself short-staffed, it is Inspector Blake who comes to the rescue with the brilliant idea of employing women drivers. The company is delighted but the bus crews- led by Stan Butler and his conductor Jack are horrified. Not only do they lose out on overtime but the women drivers are distinctly unattractive. Stan and Jack naturally do their utmost to get the new recruits dismissed, using such fiendish devises as spiders in the drivers cab, home made traffic diversion signs and some pills that make them want to spend a penny at the rate of about £1.00 per day. Meanwhile Stan and Jack allow no let up in their romantic escapades with the local dolly birds although Stan, as usual, manages to miss out. One who doesn't miss out though is Olive, Stan's sister. Much to her surprise-not to mention that of her husband Arthur, she finds that she is pregnant, and what could be more natural than one of the buses being used as an Ambulance. In the end the bay arrives making Mum the proud Grandmother of a 13lb baby boy. Will Stan and Jack win their battle of the sexes so that they can get back the over-time and once more chase after the clippies of the Luxton and District Bus Company.? 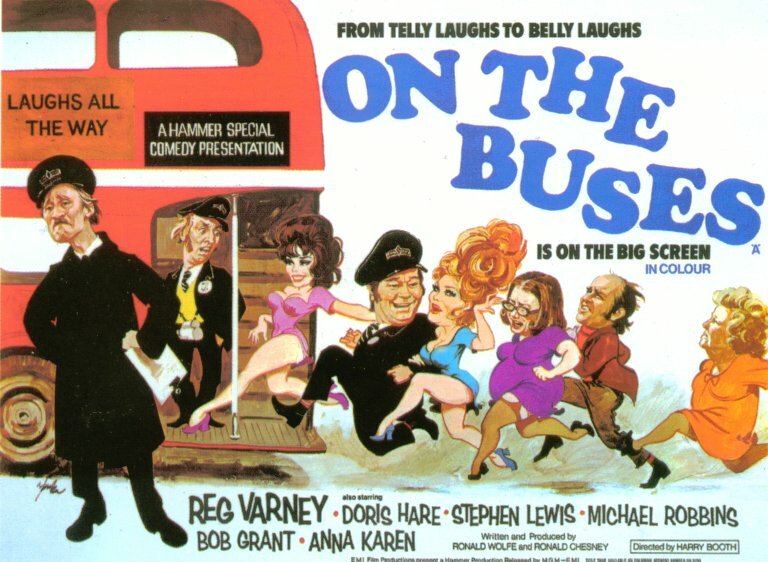 Roy Skeggs the Producer said " At first I was opposed and not too pleased when Sir James insisted I produce ON THE BUSES, but it did turn out to be a very interesting experience. I budgeted the project at 100,000Pounds. JC said "Great. You've got 90." I reduced the shooting schedule to four weeks and made it for 88,000Pounds. I negotiated on screen advertising deals with several companies worth 60,000Pounds, ending with a neg negative cost of 28,000Pounds. The film grossed millions (I received a 200Pound bonus!). It is still the only Hammer feature film to go into profit after only one week on release."